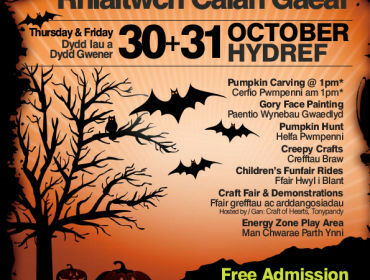 Halloween is fast approaching and the Rhondda will be fullof Jack O’Lanterns, scary Halloween-themed outfits, trick or treaters andducking apples. 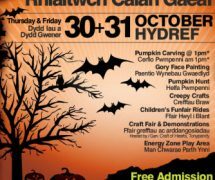 However, if you’re looking for somewhere to go and spend yourHalloween this year and take part in some really fun activities that’ll ensurethis Halloween will be one you’ll never forget then get yourself along to theRhondda Heritage Park on the 30th and 31st October. The Halloween Spooktacular is free admission and you can take part in pumpkin carving,gory face painting, pumpkin hunts, creepy crafts; there will also be children’sfunfair rides, craft fair and demonstrations and an energy zone play area. The pumpkin carving will cost £3, booking is essential and adult supervision isrequired. For more info, check out the poster to the right or phone the Heritage Park on01443 682036.